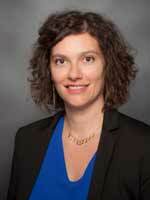 Hélène Choquet, PhD, has been a staff scientist at the Kaiser Permanente Northern California Division of Research since 2016. Her research interests are in human genetics, with a focus on identifying genetic factors which influence complex diseases and their treatments. Dr. Choquet received doctoral training in human genetics at the Lille 2 University of Health and Law in France, and postdoctoral training at the University of California, San Francisco (UCSF). During her postdoctoral research fellowship at UCSF, she was the principal investigator of an American Heart Association award. ​The objective of this project is to investigate the genetic mechanisms that drive the development of abdominal hernias. This study has three major aims: 1) to investigate the shared and individual genetic risks of different types of abdominal hernia, 2) to examine the genetic risk factors underlying recurrence of hernias in individual patients, and 3) to investigate the genetic pathways and biological mechanisms through which abdominal hernia risk loci act. The specific aims of this study are to: 1) Determine whether refractive error predicts the development of glaucoma due to direct effects or shared etiology, or both, by conducting a series of genetic analyses of the two conditions; and 2) Determine the contribution of refractive error (myopia) and relevant biological pathways in the development of glaucomatous neurodegeneration. Author(s): Choquet H; Thai KK; Hoffmann TJ; Yin J; Schaefer C; Risch N; Jorgenson E; et al. Nat Commun. 2018 Jun 11;9(1):2278. Epub 2018-06-11. Nat Commun. 2017 Dec 13;8(1):2108. Epub 2017-12-13. Author(s): Liu M; 23andMe Research Team; HUNT All-In Psychiatry; Choquet H; Zhao W; Thai KK; Weisner C; Yin J; Jorgenson E; Vrieze S; et al. Nature genetics. 2019 Feb ;51(2):237-244. Epub 2019-01-14. Cancer Epidemiol Biomarkers Prev. 2018 Apr 25. Molecular psychiatry. 2017 Sep ;22(9):1359-1367. Epub 2017-05-09. Free Radic Biol Med. 2016 Mar;92:100-9. doi: 10.1016/j.freeradbiomed.2016.01.008. Epub 2016 Jan 19. Author(s): Choquet H; Pawlikowska L; Lawton MT; Kim H.
J Neurosurg Sci. 2015 Sep;59(3):211-20. Epub 2015 Apr 22. Author(s): Choquet H; Nelson J; Pawlikowska L; McCulloch CE; Akers A; Baca B; Khan Y; Hart B; Morrison L; Kim H.
Cerebrovasc Dis. 2014;37(1):57-63. doi: 10.1159/000356839. Epub 2013 Dec 21. Cerebrovasc Dis. 2014;38(6):433-40. doi: 10.1159/000369200. Epub 2014 Dec 3. Alcohol Clin Exp Res. 2013 Aug;37(8):1311-6. doi: 10.1111/acer.12099. Epub 2013 Mar 4. ​J Clin Psychopharmacol. 2013 Apr;33(2):206-10. doi: 10.1097/JCP.0b013e318287009a. PLoS One. 2013;8(2):e57857. doi: 10.1371/journal.pone.0057857. Epub 2013 Feb 25. Neuropsychopharmacology. 2012 Mar;37(4):968-74. doi: 10.1038/npp.2011.280. Epub 2011 Nov 16. Nature. 2012 Feb 19;483(7389):350-4. doi: 10.1038/nature10798. Diabetes. 2012 Feb;61(2):383-90. doi: 10.2337/db11-0305. Epub 2011 Dec 30.